Cut and Lift dies are designed to cut partial shapes from your projects, so they can be lifted off the page to create dimension.This die set designed by Lisa Horton includes 12 dies perfectly coordinated to work perfectly together to make attractive leaves. Size: Smallest 2.12 x 1.18 inches, Largest: 4 x 1.18 inches. Cut and Lift dies are designed to cut partial shapes from your projects, so they can be lifted off the page to create dimension. This die set is designed by Lisa Horton. 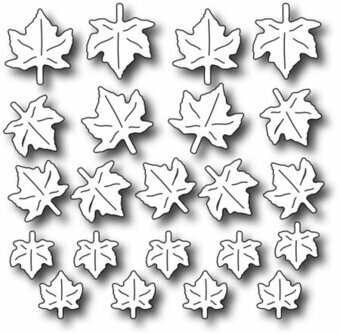 This set includes 8 dies to cut leaves and branches that will add a great floral flourish to your projects. Size: (Largest) 3.6 x 2in (Smallest) 2 x 1.6in. This is an exclusive Heartfelt Creations Die manufactured by Spellbinders and will work with most manual die cutting systems. Intricate dies may need to be run through your machine a second time, rotating the die 90 degrees with the second pass. Lining intricate dies with waxed paper will help them to "release" easily. We recommend you purchase the entire set of Cut, Mat, Create Dies, PreCut Stamps and Paper Collection to coordinate with this set of dies. This set of 7 dies consists of 1 rounded rectangle die, 3 rounded square dies, and 3 accent dies. It is designed to serve as the base for HCD-752. Dies are graduated in size, allowing you to create multiple layers with precision and ease. Accent dies allow you to add dazzling details, borders and photo corners to your paper crafting. Approximate die template sizes: 1. Large Rounded Rectangle: 3 3/4" x 4 3/4", 2. Large Rounded Square: 3 3/4" x 3 3/4", 3. Medium Rounded Square: 2 3/4" x 2 3/4", 4. Small Rounded Square: 1 3/4" x 1 3/4", 5. Large Vine: 4 1/4" x 2 1/4", 6. Delicate Flourish: 4 1/4" x 7/8", 7. Small Leaf: 1 3/8" x 1 1/4". Die-namics dies work with most tabletop die cutting machines such as the Big Shot & Cuttlebug. Royal Leaves Dies measure 0.825", 1", 1.25", 1.5", and 1.75". Die-namics dies cut through felt, cork, acetate, & SO much more! Penny Black stencil featuring a plant stem with leaves. 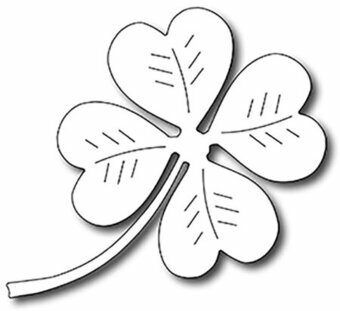 Frantic Stamper Precision Die - Four Leaf Clover. Approximate size: 2.75" x 2.6". 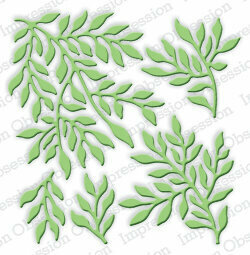 Frantic Stamper Precision Die - Gingko Leaves (set of 2 dies). Approx sizes: 1.5" x 1.8" and 1.375" x 2". This is an exclusive Heartfelt Creations Die manufactured by Spellbinders and will work with most manual die cutting systems. Approximate Die Template Sizes: 1. Leaf 1: 2.25" x 3.5", 2. Leaf 2: 2" x 2.5", 3. Leaf 3: 2.5" x 2", 4. Leaf 4: 2.5" x 2.25", 5. Leaf 5: 2" x 2". Perfect for adding fun designs to your next craft project! These craft dies work in most of the leading die cutting machines. This package contains five dies measuring between 0.75" x 1.125" and 2.25" x 5.125". Christmas themed Penny Black Creative Die featuring holly leaves. This set of two holly leaves is perfect for adding a festive floral embellishment to your holiday projects. Great for Christmas cards. Includes 2 dies. Size: 1.25 x 1.75 inches and 1 x 2 inches. This set of two dies includes a circular frame and a flourish with leaves. Includes 2 dies. Size 4 x 4.5 inches and 2.75 x 2.5 inches. This die will cut a beautiful maple leaf. Great for fall projects, or try it in green for fun nature elements for Spring and Summer as well. 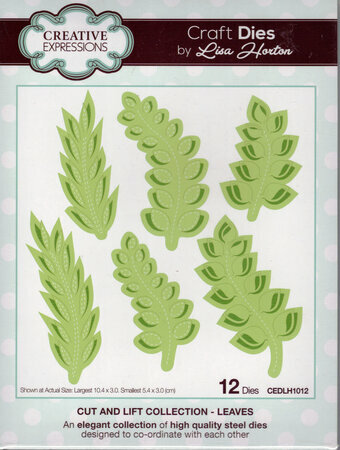 A profusion of jungle greenery is the perfect background for so many of the floral stamps and stencils available. Image measures approximately 3-7/8" X 5-1/8". High quality, precision, stainless steel stencil. Kaisercraft die featuring a circle of vines. These steel dies will cut through cardstock, thin chipboard, felt, acetate, sticky back canvas, sandpaper, foam and much more! They work with virtually any die-cutting machine that will accommodate wafer-thin dies and are sure to become an essential ingredient in your paper crafting process. Penny Black Craft Die featuring a background pattern of leaves. This die is the perfect accompaniment to your Altenew floral stamps, or can be used on its own as a beautiful garland to adorn your projects. There is 1 die in this set. A large maple branch and leaves lends itself to so many stenciling techniques for Fall. Design area measures approximately 3-7/8" X 5". Made from premium stainless steel. Designs copyright Lynell Harlow and Dreamweaver Stencils. Craft die featuring a plant stem with leaves. 100% steel craft die for use on cardstock, felt, and fabric. Use in most leading die cut systems. 2.3 x 4.5 inches. 5.9 x 11.5 centimeters. Part of the Spring 2014 Memory Box Release, this stencil features bare tree branches. 3.9" x 5.6" (10 x 14.3 centimeters). Works with the Leafy Branches stencil 88557. Craft die featuring leaves and flowers. 100% steel craft die from Memory Box. For use on cardstock, felt, and fabric. Cut, stencil, emboss, create. Use in most leading die cut systems. 9 dies included. 100% steel craft die from Memory Box featuring three Christmas-themed holly leaves. For use on cardstock, felt, and fabric. Cut, stencil, emboss, create. Use in most leading die cut systems. Craft die from Memory Box featuring a flower with leaves. For use on cardstock, felt, and fabric. Cut, stencil, emboss, create. Use in most leading die cut systems. 2.5 x 2.2 inches billow flower background, 0.7 x 1.7 inches leaves. 6.4 x 5.6 centimeters billow flower background, 1.8 x 4.3 centimeters leaves. Nellie's Choice - Shape Dies Leaves 3. These brancvhes are perfect for adding floral accents to your projects. Use together or alone in various colours and shades. Size Smallest 1" x 1.5" Largest: 1.5" x 2.25". A great folder for Christmas and winter cards. Design with branches and snowflakes. 1 pcs; 5.5 x 5.5 inches. Craft die featuring a corner filled with flowers and leaves. Memory Box/Poppy Stamps craft dies are made of 100% steel. For use on cardstock, felt, and fabric. Cut, stencil, emboss, create! Use in most leading die cut systems. 2.7 x 2.9 inches, 6.9 x 7.4 centimeters. Christmas themed craft die featuring holly leaves. Memory Box/Poppy Stamps craft dies are made of 100% steel. For use on cardstock, felt, and fabric. Cut, stencil, emboss, create! Use in most leading die cut systems. 1.7 x 1.5 inches. 4.3 x 3.8 centimeters. Craft die featuring leaves. Memory Box/Poppy Stamps craft dies are made of 100% steel. For use on cardstock, felt, and fabric. Cut, stencil, emboss, create! Use in most leading die cut systems. 0.6 x 0.8 to 1.1 x 1.2 inches. 1.5 x 2 to 2.8 x 3 centimeters. Poppy Stamps craft die featuring several pine needles. 1 x 0.7, 1.1 x 0.8, 1.2 x 0.8 inch; 2.5 x 1.8, 2.8 x 2, 3 x 2 centimeters. Poppy Stamps craft die featuring 3 autumn leaves. 1.7 x 1.6, 1.3 x 1.2, 1 x 0.9 inch; 4.3 x 4.1, 3.3 x 3, 2.5 x 2.3 centimeters. These Shapeabilities Edging Leaf Etched Dies from the Joyous Celebrations Collection by Sharyn Sowell bring joy and celebration. A set of two borders that are perfect accent on a card, scrapbook page, mini albums or even on a home decor piece (think edging a cupcake stand!). Every day is a party with Sharyns new line of dies and stamps. Her imagery is based on meticulously hand cut silhouettes mixed with a blend of calligraphy and whimsy. This collection will allow you to create and spread Joyous Celebration no matter the event or time of year. Approximate Size: Edge: 3.80 x 1.70 in, Vine: 4.15 x 0.65 in. Shapeabilities Palm Fronds Etched Dies Tropical Paradise by Lene Lok. Spellbinders Shapeabilities cut, emboss and stencil with a single die template. The Palm Fronds Etched Die set from Tropical Paradise Collection by Lene Lok includes three different palm fronds designs. Let Lene be your tour guide to a paradise of contemporary designs on all things tropical! Use them on your next creative adventure. Half Palm Frounds: 1.65 x 3.70 in., Full Palm Frond: 2.60 x 2.80 in. Shapeabilities Palm Leaf Wreath Etched Dies Tropical Paradise by Lene Lok. Spellbinders Shapeabilities cut, emboss and stencil with a single die template. The Palm Leaf Wreath Etched Die set from Tropical Paradise Collection by Lene Lok includes two accent leaf designs and one wreath shape. Let Lene be your tour guide to a paradise of contemporary designs on all things tropical! Use them on your next creative adventure. 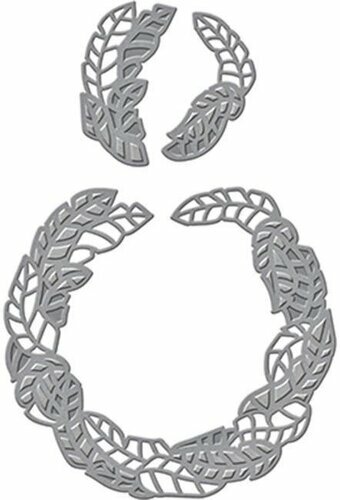 Leaves Small: 1.80 x 1.10 in., Leaves Large: 2.00 x 1.15 in., Wreath: 4.00 x 4.00 in. Our shoreline Bullrushes die measures 0.8" x 2.25". Mix and match it with our Shoreline Cattails (FRA9881), Shoreline Reeds (FRA9879) and Shoreline Grass (FRA9880). Frantic Stamper Precision Dies are made in the USA and will work with most leading table-top consumer die cutting machines. Our shoreline cattails die measures 0.875" x 2.75". Mix and match it with our Shoreline Bullrushes (FRA9878), Shoreline Reeds (FRA9879) and Shoreline Grass (FRA9880). Frantic Stamper Precision Dies are made in the USA and will work with most leading table-top consumer die cutting machines. Perfect for adding fun designs to your next craft project! 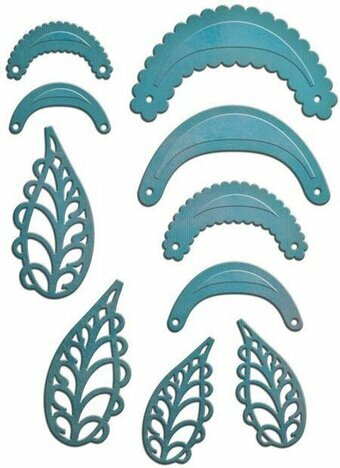 These craft dies work in most of the leading die cutting machines. This package contains four dies measuring between 1" x 1.5" and 2.75" x 5". Spellbinders is proud to offer the latest designs from the Amazing Paper Grace collection by Becca Feeken. This new line is royally beautiful and richly created, to add grace and elegance to any creative project. This Stack and Fan Flowers design allows you to create gorgeous 3-D flower elements that you can layer to perfection. Perfect for Cards, Gifts, Parties, and more! Approximate Size: Petal 1: 2.70 x 1.50 inches, Petal 2: 2.50 x 1.30 inches, Petal 3: 1.90 x 1.05 inches, Petal 4: 1.75 x 0.90 inches, Petal 5: 1.40 x 0.75 inches, Petal 6: 1.30 x 0.70 inches, Small Leaves: 0.90 x 1.8 inches, Large Leaves: 1.10 x 2.25 inches. 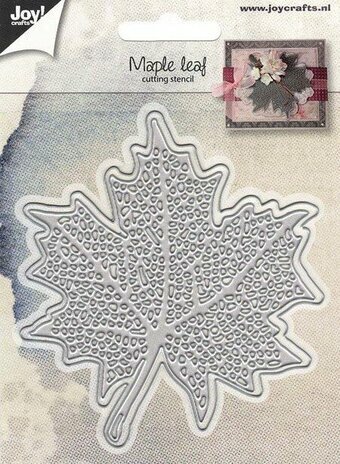 Shapeabilities Layered Leaf Vines Etched Dies Timeless Heart Collection by Marisa Job is a set of four dies in different leaf vine designs and sizes - perfect for a layering element. Licensed Designer Marisa Job brings sweet floral and heart motifs together to create this Timeless Heart Collection to help add beautiful elements into projects. Spellbinders Shapeabilities cut, deboss, emboss and stencil with a single etched die template. Approximate Size: Small Outline and Solid Leaves (2): 1.60 x 1.70 in. 4.10 x 4.30 cm, Large Outline and Solid Leaves (2): 2.10 x 2.30 in. 5.30 x 5.80 cm.